You can select the KeeneticOS update channel in the web interface of the router. For example, you can install a pre-release of KeeneticOS by selecting the Beta version channel. Beta is the official release of updated components that have passed internal testing and are in the final debugging stage. Such releases are published in order to quickly eliminate previously discovered bus, as well as to familiarize users with new features that have not yet been completed. Installation of a beta version does not change the warranty and technical support conditions. NOTE: Important! To update KeeneticOS you need to have an established Internet connection. Go to the 'General system settings' page and click 'Component options' in the 'Updates and Component Options' section. 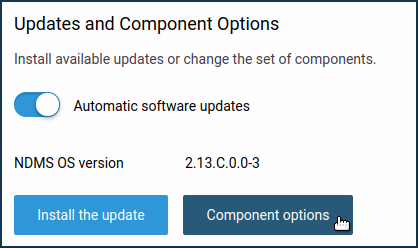 In the 'Systems Component Options' window that appears, select the 'Beta version' update channel. Confirm the action to change the components. 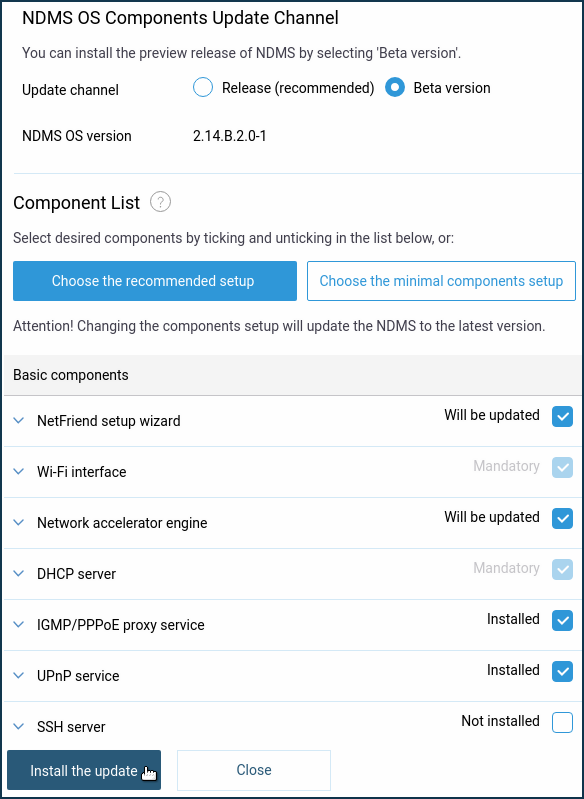 After that you may select the system components you want to use or keep the same setup. Click the 'Install the update' button at the bottom of the page. The process of updating the Keenetic operating system will begin. NOTE: Important! Do not turn off the router until the upgrade process is completed. After the update, your Keenetic will automatically be rebooted and then ready to use again. To access the web interface refresh the page in your web browser. Then, on the 'System Dashboard' starting page in the information panel 'About the system', check the current OS version.